Photo Contest Entry #58 - Mangoes Anyone? A female cousin of mine was here on vacation earlier in the month (December) and was having this delicacy for the very first time in her life! She is in her thirties, so in relation to mangoes, as we say here in Jamaica “half a har life gone”! The picture attached is a portion of an East Indian mango and this is how she eats it. Poor girl doesn’t have a clue. I had to shake my head. Back when I was a youngster my grandmother loaded up around ten of us in a pickup truck and took us to mango bush. To relate that day’s experience would require an entire book. The only bad part was the colic that night. Being from the parish of Manchester, which for the most part is cold, mangoes aren’t found on trees as readily as in most other parts of the island. When we were let loose in the mango walk we were confused, and could only bite one and throw it away before moving on to the next. Mango fi stone dawg. I’ve had occasion to travel to the United States and what they have there masquerading as fruits is nothing short of appalling. The biggest and prettiest pineapples, bananas, oranges, and mangoes are either fresh or sour, bar none. This is because they are harvested before they are fully mature so they will arrive at market looking at their best. Looks are deceiving. Everyone over there should have the experience of eating a sun ripened, freshly picked pineapple or mango right here in Jamaica to make their own comparison. Well… no comparison really. Our tourism people are falling down on the job. I have friends from St. Elizabeth who don’t eat Fine Skin or Common mangoes now and I entirely understand why. They had too much when they were young. 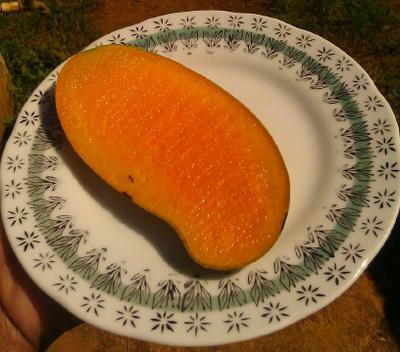 As for me, who never had it like that, any type of mango is “fare” game (yes I know its fair). My grandmother when she was alive preferred to eat her mangoes at night. It wasn’t until I was an adult that I learned why.... you don’t see the worms so easily at night. And for the record the Julie mango is the best!!!!! Have a picture that depicts the essence of Jamaica? Submit it here for a chance to win! || Click Here to see other adorable entries. This is the 1st and only time that I am responding to something like this. You are 200% correct about eating a sun-ripened fruit straight from de tree. My #1 mango is BOMBAY. To each it, cut in a circle around the middle then twisted apart. The flesh is so smooth and sweet that it melts in your mouth. My mouth is salvitating for one right now. I have been told that Bombay mangoes are hard to come by as a lot of the trees were destroyed by the hurricanes over the years. Yes the Julie is indeed the best. The Robin mango is not far behind though. I was hoping to hear mention made of the local apple though.